Bob Sinclair died May 10 at age 77. Bob Sinclair, the American marketing executive who pushed Saab to design more luxurious cars and created one of the Swedish automaker's best-known vehicles -- the 900 Convertible -- died May 10 at his home in Santa Barbara, Calif., after a three-year battle with cancer. He was 77. Sinclair started with Saab in the United States in 1958 as a field representative. He jumped to Volvo in 1961, unhappy with Saab's plan to move its U.S. headquarters to Connecticut. 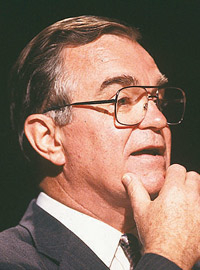 Sinclair returned to Saab in 1979 to lead the U.S. operation, Saab-Scania of America. In the early 1980s, Sinclair was pushing Saab to add more content and luxury to its cars so he could move the brand upmarket in the United States and boost profits. But Saab executives in Sweden were focused on building less expensive cars. It was a clash of those goals that provided the spark for the 900 Convertible. As recounted in a 2006 article in AutoWeek, a sister publication of Automotive News, Saab pushed Sinclair to take 1,000 units a year of the two-door 900. Sinclair could equip the cars as he wanted. Working with Heinz Prechter's American Sunroof Co., of suburban Detroit, Sinclair had a 900 Convertible concept created, and the car was unveiled at the 1983 Frankfurt auto show. It was an instant hit -- at a time when many automakers had abandoned convertibles. Production of the 900 Convertible started in early 1986. Sinclair also dressed up 900s with the high-performance Special Performance Group package and was a driving force behind the Saab 9000 model. Sinclair retired from Saab in 1991. He and his wife, Anne, moved to California. Sinclair was on the boards of McLaren Performance Technologies and Catalytic Solutions Inc. He was also a fixture at Saab owner conventions.